The automatic flare layouts of Vispol can be applied by simply putting the appropriate layout object on the table (the Virttable to be precise). As soon as the object is removed the layout of the objects will be restored. Magnet objects can be declared with a combination of tangible and multi-touch interaction: for instance one magnet can be a victim magnet, which attracts all victim persons. Another magnet can be configured to attract male persons. The result will be that male persons gather around the male magnet and victims around the victim magnet. Additionally, male victims will arrange in the middle of those two magnets. There is a pan magnet that allows to move the Vispol visualization around. If a scale object is added to the pan object the visualization can be scaled by rotating this object. Person objects can be used to create, modify, delete and connect persons. The connection of persons works very nice: two person objects can just be put on top of two persons on the screen and then the objects can be moved to each other until they touch themselves. 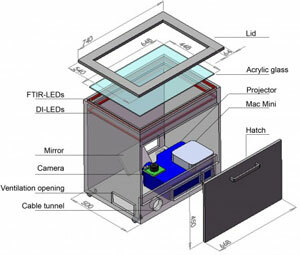 The persons underneath the objects will then be automatically connected. A timestamp object allows to save the current state into a timestamp object. As soon as this object is added again to the scene the saved state will be restored. Technically, this interface has been realized with reacTIVision as underlying tracking engine for the objects and the multi-touch input. The application itself is an enhancement of my Master’s thesis project Vispol, which is written in Adobe Flash Actionscript and Adobe Flex. Frederic has developed a very nice framework for the integration of the TUIO-based fiducial messages into the Adobe Flash AS3 TUIO classes of the nuigroup’s Touchlib. 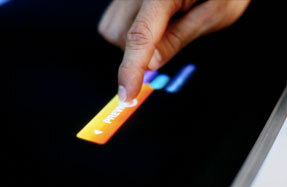 reacTIVision has reacted only very slow to multi-touch input and can in no means compete with the Touchlib as it comes to multi-touch interaction. 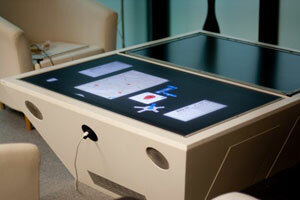 Thus, a software that could provide both – a reliable object and multi-touch tracking – would be great. 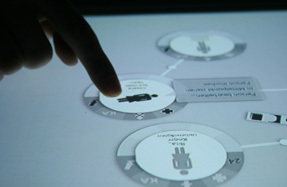 Here you can see a video of the multi-touch capabilities of Vispol.